Today’s post is my tribute to the late Ronnie James Dio, who died two years ago today of stomach cancer. “Who was RJD?”, you may ask. Well, for me he was one of the greatest rock singers to have walked the Earth, and perhaps the best metal frontman ever. His voice was amazing, and he could just do anything with it, from soft, heartfelt ballads to high-pitched screams, the man had it all! Besides that, his career was long and prosperous, until his death at 67. He started in the 50’s with a few rockabilly bands, like The Vegas Kings, Ronnie & The Rumblers, Ronnie (Dio) & The Red Caps and Ronnie Dio & The Prophets (’62-’67). A snapshot of what he did in those ancient times is the cover of a The Shirelles song, Will You Love Me Tomorrow. After that, he formed the Elves and its various versions, until the final lineup of Elf. A staple song of that era is Nevermore. Elf opened for Deep Purple in the early 70’s, and Ronnie became friends with the guys there. After Ritchie Blackmore left Deep Purple, he approached Dio and together with some guys from Elf, formed Ritchie Blackmore’s Rainbow, which after one album, was renamed to Rainbow, now with the great, late, Cozy Powell taking over the drums. Rainbow were a hugely successful hard rock band, turning more commercial after Ronnie’s departure in 1979. Four great songs from that era are the amazing Temple of the King, the rocker Gates of Babylon, the bluesier Catch the Rainbow and the ballad Rainbow Eyes (probably one of the most beautiful songs I’ve ever heard). After Rainbow, Ronnie joined forces with Black Sabbath, who were falling apart after firing Ozzy because of his constant drunkenness and drug state. He completely revolutionized their sound, which was somewhat undefined in their last 2 albums (far from the brilliant songs of the early 70’s). He was also responsible for the introduction of the horns \m/ symbol in metal! Albeit short, his tenure with the Sabbs was very successful, with Heaven and Hell becoming their third highest selling album. Three very good songs from that album and Mob Rules (the second album) are the mammoth title track Heaven and Hell, the faster Die Young and the softer Over and Over. When he left Sabbath he decided to create his own band, DIO. Their first album was another hit, and Ronnie definitely and permanently stuck with the metal outfit. His tenure with Dio was the longest in his career, from 1983 until his death, with some intermissions: between 1991-1993 to reform the 1980 Sabbath lineup and release their heaviest album since the 70’s – Dehumanizer. 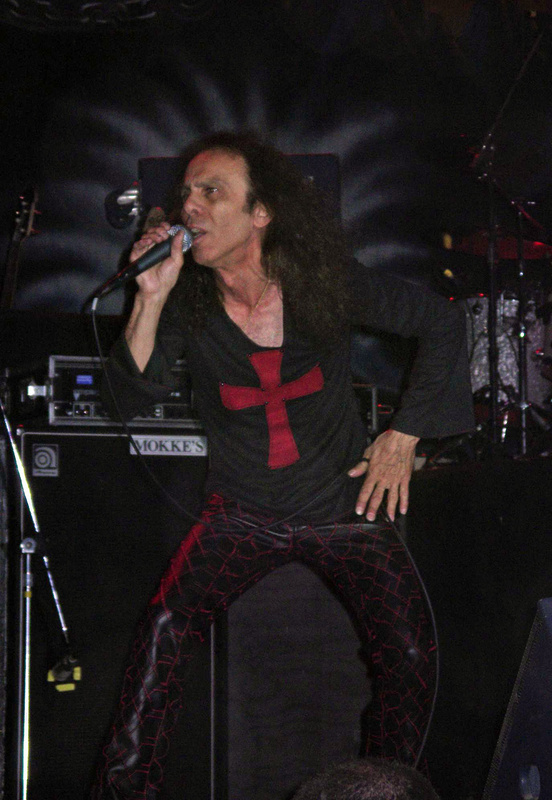 Since 2006, Dio rejoined forces with his friends from Sabbath Tony Iommi, Geezer Butler and his drummer of all times Vinnie Appice, and formed a side project to Black Sabbath, Heaven & Hell. They toured the world and released a new album (amazing stuff) in 2009, from which they released the single Bible Black. They were going to play here in Portugal, and your friend here was ecstatic. In a turn of events, he was diagnosed with cancer and died a few months later. Incidentally, one of the last songs he recorded, with his cousin David “Rock” Feinstein, was called Metal Will Never Die. True, but a lot poorer without his voice. Just listen and see what he was still capable of doing at 67! As one of my favourite artists, I had been thinking of introducing him here, and I couldn’t lose the opportunity of paying him a tribute this way. So, here’s the playlist with all the 13 songs I posted here. We apologize for yesterday’s blackout. Friday night means poker night so we couldn’t make a post on time. Talking about it there’s this song that pops into my head every time I think about going out (How I Met Your Mothers’s fault I guess…) from The Proclaimers called 500 miles. Anyway, in today’s post I’ll be sharing with you one of my favorite guitarists. I love his work and the way he plays the guitar. May I present you, Tommy Emmanuel. Due to the last CacophonicEuphony post with Lourenço’s jazz suggestion, these last two days Ella Fitzgerald has been making me company in my mp3 player.